Fourth research stay: Penn Museum of Archaeology and Anthropology, Philadelphia. A leitmotiv of Meroitic textiles, the color blue is omnipresent in virtually all decor: stripes, embroideries, tapestry…etc. Sometimes, it even covers the entire expense of the fabric. Interestingly, it is very rarely associated with another color and is a constant companion to the use of cotton. 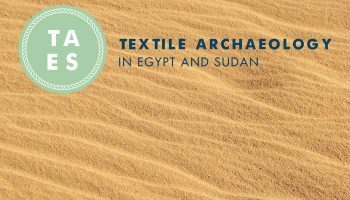 So much so that it seems that Meroitic textiles are best defined by a camaïeu of white and blue cotton cloths. This tendency is surprising in the Antic world. So rare are the mentions of blue in Graeco-Roman literature that scholars long doubted that the ancients could see this color at all! Under the pharaohs, the Egyptians valued the purity of white garments, when their successors enjoyed the addition of red and purple from the Hellenistic tunics and mantles. But in Sudan and Nubia, blue played the central role. 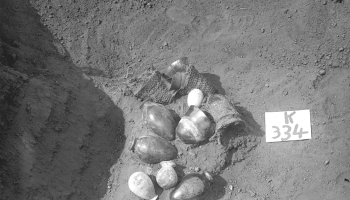 As today, the world of Nubian and Sudanese populations was a very mineral landscape dominated by the golden sands of the Sahara and the light ochre of sandstone. These colors echoed in the material landscape, where ochre, clay, wood and reeds formed the bulk of the artefacts of daily life. Only the deep green of the Nile and the nearby cultivation really broke the ground’s monotony. But look up! Uninterrupted by clouds or sharp relief, the Sudanese sky offered a magnificent and everlasting blue backdrop to this rocky environment. The omnipresence of blue in the natural surroundings of anyone leaving under those latitudes might explain the importance given to the color blue throughout the history of Sahelian Africa. Blue became the most prized color along the Nile valley as early as the Neolithic. Blue stones and blue faience were used extensively for jewelry, and soon lapis lazuli or Egyptian blue pigments started representing the flesh of the god Amun as well as the hair of other deities. Later on, indigo dyes made the fortune of the medieval African kingdoms, travelling with the caravans crossing the Sahara from the 8th to the 16th centuries. Indigo clothing are still to this day the most valued dress for many people throughout West Africa, such as in Niger, Algeria, Mali, Ghana, Burkina Faso, or Nigeria. Incarnation of the sky and the heavens, indigo blue became synonym with the “path to the infinite”. In ancient Sudan, blue occupied a very special place in the visual landscape, as it adorned many architectural elements linked with the religious cult, especially with the god Amun: blue pigments were notably applied on temples, kiosks, and divine statues. Brightly painted in blue, statues of the woolly ram-god, the Nubian incarnation of Amun, lined the processional ways leading to the temples. 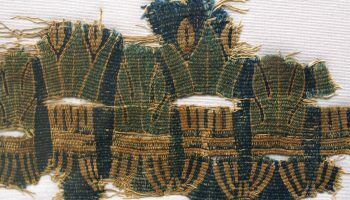 But it also played a major role on people’s bodies, thanks to a large repertoire of blue cloths and personal ornaments. 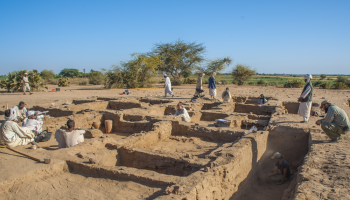 Polychromy research is only starting in the field of Sudanese archaeology, and is still mainly focusing on architectural decor as new discoveries continue to bring new evidence on the diversity of painted buildings. My focus hasn’t been the urban and built environment of the Meroites, but their own personal bodies and the way they reflected cultural processes. Crossing textile analysis with the study of preserved parietal representations of costumes will return the Meroitic dress practices to their originally colorful selves. The blue fleece represented on Amun statues seems to find interesting parallels in the blue cloths dressing the members of the nobility. From blue gods, to blue wool, to blue textiles… the color blue united the people to the temples, to Amun and to the sky. That is a little fantasy of mine anyway! Since archaeology is made with more than just dreams (or so I hear! ), I am seeking out the “roots” of the Meroitic passion for blue cloths, starting by decoding their technique. 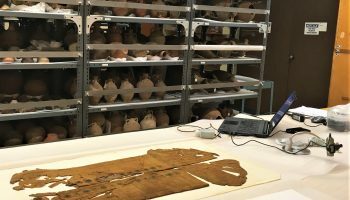 It motivated my return to the Penn Museum in Philadelphia, to analyze and sample the fantastically well preserved textiles found on the Nubian site of Karanog. 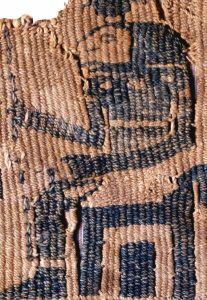 There, the textiles show deep blue ground weave decorated with tapestry bands of beige, light and dark blue swastikas or anhk crosses. Plain blue stripes and bands of blue offering tables lined the bottom of textiles used as warp-around garments. 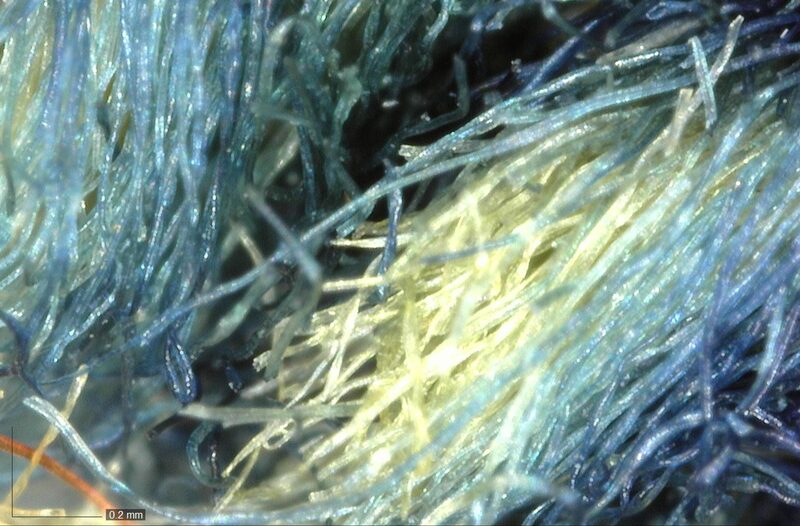 Closer scrutiny reveals that the fibers were dyed when already spun: the inside of the threads are still showing the natural color of cotton, when the outside fibers shine with a deep blue hue. The dye analysis results are still pending, but as always, this collection didn’t disappoint and rewarded me with lots of beautiful and vivid blues. Could they be the premise of the African and Saharan love for indigo? Acknowledgement: A great “thank you” to Jennifer Wegner for assisting me once again in my research. Thank you to the Penn Museum for allowing me to take samples, and to Dr. Magdalena Biesaga (Laboratory For Flow Analysis and Chromatography, University of Warsaw) who accepted to bring her scientific skills to help in my inquiries. References: M. Pastoureau, Bleu. Histoire d’une couleur, Editions du Seuil, 2000 ; C.E. McKinley, Indigo, In search of the color that seduced the world, Bloomsbury, 2011 ; J. Anderson and Salah Mohamed Ahmed, “Dangeil 2012: Sacred Ram – Avatar of the God Amun”, Sudan & Nubia 17, 2013, p. 70-77.